Editor's Note (From Laurie): As some of you know, I used to work in the solar energy industry, but my experience is with solar thermal (space heating and hot water). I'm pleased to tell you that a friend of mine, Jerry Noel, has agreed to share his knowledge as a Master Electrician and a NABCEP Certified solar installer. 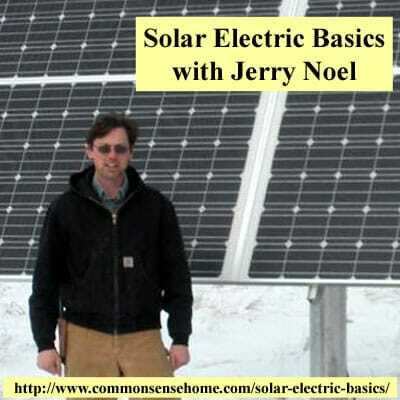 This is the first of our new series, “Solar Electric Basics with Jerry Noel“. Solar electric, also technically known as “photovoltaics” (PV for short), is the conversion of sunlight into electricity. The predominant resource for this conversion is the silicon chip; the same kind used in computer cpus. Over the course of a series of articles, I will try to explain how a solar panel system (array) is installed, what it can produce, and approximately cost. I will also delve into many of the many FAQ’s involved with this science. That is the most common question, so I will hit it first. The answer is “How much power do you need?” or “How large an area do you have?” There is no easy answer to this one. If you want a system that will offset your entire utility bill then you need to determine your demand. Do you have 5 plasma televisions, electric appliances, high wattage incandescent light bulbs (that are always left on), multiple video game systems, and a hot tub then you will need a system the size of Rhode Island! Do you have CFL or LED lights? Are your appliances “Energy Star” rated? Do you turn off lights when not in use? Then you could offset most of your electricity usage with a “small” system. I consider “small” as one under 3-kilowatts. A standard solar module is around 250 watts and is 5.5’ x 3’. This question is almost impossible to answer in a basic format like this. More information is needed along with a shading analysis to give to a good ballpark number. Current trends show that a roof mounted system costs in the area of $5 per watt installed. A pole mounted tracker system, one that follows the sun, costs around $10 per watt. Add $3 or more per watt for anything that has batteries. Do I need batteries for my solar electric system? Do you want power during an outage? Solar panels create power in the form of direct current (DC) electricity when the sun is shining. Inverters take the DC and change it to 60 cycle alternating current (AC) for our usage. Underwriters Laboratories requires that all grid connected inverters automatically disconnect from the utility grid if they sense an outage. This is a safety precaution for the utility linemen. Electric utilities have sensors scattered among their distribution network. When they sense an outage, crews are automatically dispatched to rectify the problem. If you are feeding small amounts of power to the grid, it can confuse the sensors and delay the repair crews, potentially endangering people working on the power lines. To have power during an outage, you MUST have a system with batteries (or a generator)! Can I install a solar electric system myself? Sure why not? First, grab the black wire, and then grab the other black wire. Oh, by the way, the voltage difference between them is 500 volts. I hope you have good gloves. Am I trying to discourage you from doing it yourself? Yes. Am I trying to keep you alive? YES! I was working on a system a year ago, had good gloves on (but they were a little wet), and touched the wrong thing. It felt like I was hit in the chest with a baseball bat. I’m an electrician and am used to getting a shock. That was PAINFUL! Solar power systems generate seriously large amounts of voltage; why risk it? Editor's Note: You can attend training seminars to help you get the proper training you need to safely install your system. Also, some contractors may work with you to allow you to do some of the structural work, such as erecting a framework for the panels. Please get proper training before attempting any electrical work. Information on this site is provided for reference purposes only. This is a guest post by Jerry Noel. Jerry is a Wisconsin Master Electrician and a NABCEP Certified solar installer. NABCEP is a voluntary credential, considered to be the cream of the crop for renewable energy professionals. NABCEP stands for North American Board of Certified Energy Practitioners. Jerry is a foreman for Krantz Electric in Verona, WI. They are located a few miles to the south-west of Madison. Krantz Electric does residential, commercial and solar electric projects. In the past, I have taught solar electric theory and installation for the IBEW, Midwest Renewable Energy Association, and Solar Energy International. Please visit the Krantz Electric website for more information. Thanks for starting this new series! Looking forward to future posts. Doing my off-grid system with 4 250 watt panels and a 3,000 watt wind turbine was relatively easy once I did my homework. We run my garage, shop and barn off the system, and partially heat hot water for the house. I used a 24 volt element in my water heater for the dummy load for the turbine. I bit the bullet and invested in good batteries and battery protection equipment, and I am glad I did. There are good books on the subject out there. Study up and save the cost of a licensed electrician. I figure I saved about $4,000 doing it myself. Bob, Yes, you can do things yourself but if you ever have a problem; good luck troubleshooting it. You are also off-grid which means no inspections. If you are grid connected, the utility will require permits and inspections. That you cannot do yourself. Besides, if you ever have a fire the insurance company can AND WILL bail out on you for not having a licensed professional install your system. Great intro to PV topics! What are your thoughts on ACPV (per code)? Jack; If you asking about AC modules, I think they make installation much easier. It takes all of the DC section out of the code as well as the section on voltage spiking from modules on cold days. Instead of worrysome open circuit voltage calculations, now we just have to size the conductor which is a far easier calculation. Helios is revolutionizing AC modules and they are made right down I-94 in Milwaukee. I plan on tackling AC modules as well as Enphase microinverters in article 5 or 6. At what point in the system would I encounter 500 volts?? Harold, On the DC side of the inverter. Modules are connected in series to build voltage. This decreases amperage and keeps wire sizes smaller. Inverters can handle 500 to 600 volts DC. In Europe, they are rated up to 1000 volts DC! What if I wanted to run an off grid ”back up” system? Like, running a separate AC ”system” to plug in certain essential appliances, like refrigerator and TV etc. Not a whole house system or tied into the house grid system. Would that pose a big problem? Or should it just have large extension cords for those items to keep from having ”legal” problems. Thanks. The safest option would be to install a sub-panel for critical systems with a cut over switch to isolate your home power system from the grid, which is described in detail in the post Emergency Power Options for Your Home – Gas Generators and More.